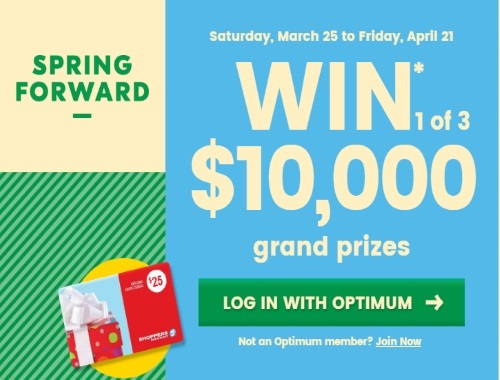 Spring forward with Shoppers Drug Mart! Enter to win 1 of 3 $10,000 grand prizes in their new contest! Plus you could instantly win a $25 gift card just by exploring everything you need for spring! Between March 25-April 21 get an additional PIN card when you spend $10 or more on almost anything in the store. Contest closes April 23,2017. Limit one contest card per eligible transaction regardless of total dollar value of transaction. Maximum of 28 entries per person. To obtain a PIN code without a purchase, click here.